I finished my final birding trail of the season in Bodimettu (Tamil Nadu) and Munnar (Kerala). Unfortunately, the weather was overcast with intermittent rains, especially in Kerala. Cold winds and the bluish mist turned the streets of Munnar into old photographs. As pretty as that sounds, it was not the best conditions for birding. The cottage where I stayed was in the middle of a 15-kilometer hot zone for elephants. Hence I also had to spend a good deal of time during my trails on the look-out for them. They are the Incredible Hulks of the wild. “They are always angry”. And rightfully so, given how we treat them like beef. Sorry, domestic cattle. However, on a cloudy Sunday morning, I struck gold . And emerald doves. Birds of colourful feathers flocked together to show up in a section of a nearby reserve forest. I was able to, in just a few minutes, spot a juvenile Speckled Piculet, a Blue-Capped Rock Thrush, a pair of Large Hawk Cuckoos and a Banded Goshawk. 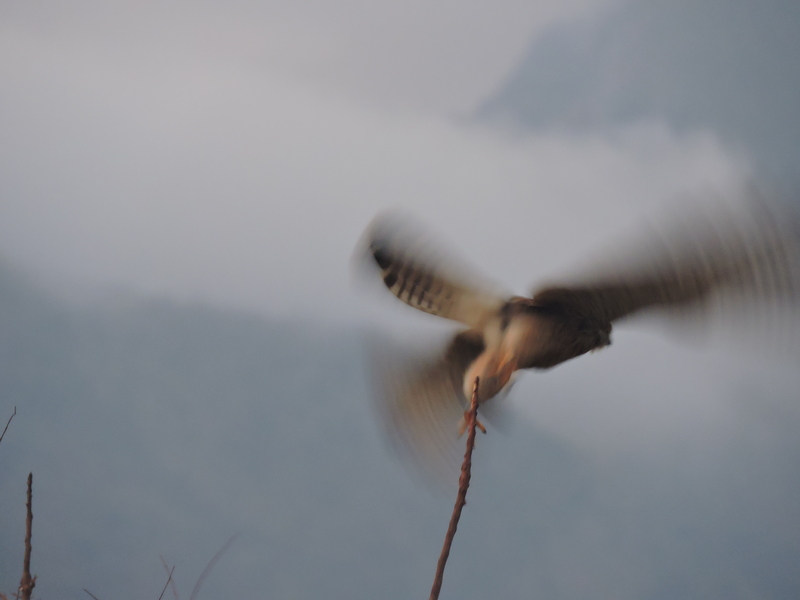 The highlight of the trip was the Common Kestrel. I spotted a beautiful huntress a few months ago at the Vedanthangal Bird Sanctuary in the low light of a misty morning. But she flew away before the sun could show me just how beautifully polka-dotted she was. This time around, on the way to Munnar, I saw an adult male resting on the branch of a tree. Instead of admiring his colours, I jogged towards his direction, hoping for a clearer angle to take a photograph. In doing so, I stepped over some dry leaves. And away he flew, leaving me with a fleeting visual of his posterior. I pretended to be okay with this; that everything happened for a reason and such. Inside though I was having a mild panic attack. Of course I had gotten greedy and messed up a good opportunity to photograph a beautiful bird. On my way back to Chennai, I spotted him again at the same location. He was perched on a lower branch. I squealed as silently as I could, got out of the taxi and tip-toed, like a burglar in a cartoon, towards the side of him. I saw a few vehicles speeding towards our direction from half-a-kilometer away. I clicked a few photographs as quickly as I could. Seconds later, two cars and a van sped noisily past us. The Kestrel could care less. He just stood there, unperturbed. After 5 minutes or so, he flew upwards and sat on a tree near the bend of the road. I walked up towards him, which took me another ten minutes. I easily found him, and photographed the burn-marks on his breast to my heart’s content. He was still restricted in movement; almost indifferent to an intrusive stranger. I thought to myself that it was an annual bonus from Mother Nature after a year and a few weeks of active birding; that everything happened for a reason. My pleasure. Truly poetic@ un-spun in to the night, we shall unveil our wounds. Lovely poem.. and lovely birds! Like plantains–nice surprising description, yet comforting. hehehe nicely put. but surprisingly enough, this one is for the peeps! RIG it is 🙂 i ll also turn it into an imaginary verb for our conversations. I’ll be like “RIG, did you rig the goats over the clouds like we discussed? Loved it ❤ Missed reading all wonderful posts. Good Wishes. I wuvvvs the two love birdies on the wire ❤❤❤I can has them?? 🙂 fair i say, trogon you shall be seen by naked winter eyes vonlys! christy Bharath is one of the most eloquent contemporary poets I’ve encountered. His verse always delights and his evocative mix of words continues to surprise my curious mind. An added bonus is that his beautiful description of birding adventures allow my blind eyes to again experience th wonders of Nature. Thanks Tio, I really appreciate your constant support ! I love the imagery of “kiss-stains for footsteps” !